Word-of-mouth has always been one of the most valuable forms of marketing. We tend to be more receptive to recommendations from a person they trust, than to ads or other corporate messaging. The power of word-of-mouth is especially significant in China than in any other countries, possibly due of the chaotic market and lack of trust between businesses and customers in China. That’s why KOL (Key Opinion Leader), or influencers as commonly known in the west, is an important key tool in any Chinese marketer’s arsenal. Chinese KOLs are people who have large social media presence and followings who could influence consumers’ purchasing decisions. They do not only spread information, but also life attitudes, thoughts and ideas. KOLs in China are active across different social media, including Weibo, WeChat, Youku, Meipai, Yizhibo, Douban and so on. If being used wisely, engaging KOLs are powerful to magnify brand awareness, attract new followers, build brand credibility and ultimately alter purchase behaviours and habits. Bloggers usually create and post original content. They share personal life stories and inspiring moments, aiming to connect with followers on a personal level. Literally means “Web Celebrity” in Chinese, Wanghong get famous mostly because of their appearance. They could be fashionistas or beauty gurus who frequently posts beautiful pictures to attract followers. Wanghong have huge fan bases, yet the cost of advertising with them is far lower than the price of engaging mainstream celebrities. Eg. Chong chong is a fashion Wanghong with more than 2.4M fans, who posts about fashion and cosmetics reviews. She often uses live streams to interact with her followers. Communities and interest pages are KOLs that focus on collecting and publishing news from different brands. It serves as an information hub which they share latest information or events of a certain topic, such as celebrity gossips, music, movies, science, etc. Eg. 博物杂志(Bo wu za zhi) is the official account of Natural History Magazine with more than 6.5M followers on Weibo. Followers interact with the page by tagging the page and asking questions about math and sciences. 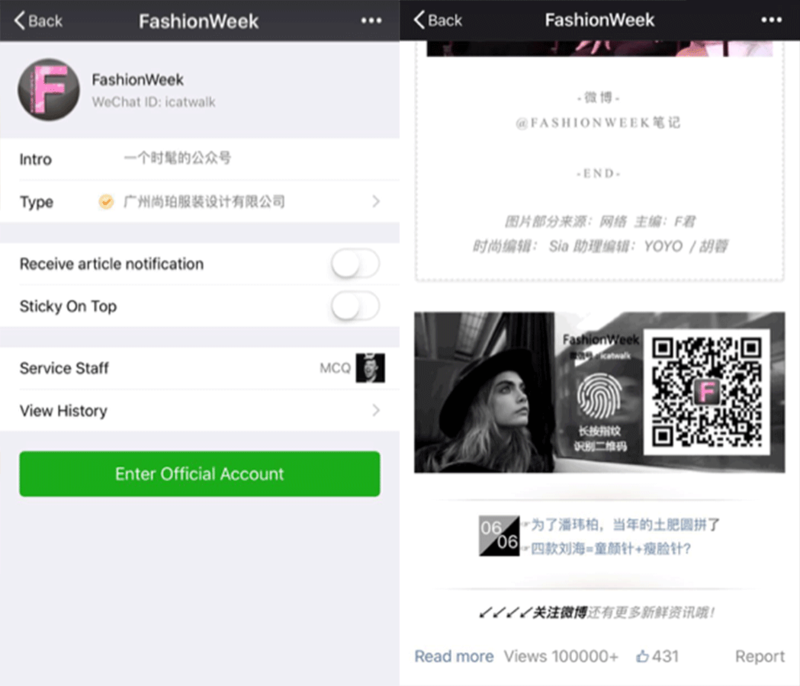 FashionWeek is a WeChat public account that publishes fashion tips and news. Their posts often receive more than 100K views. Brands pay KOLs to share the contents and pictures they created, aiming to get exposures by leveraging the KOLs’ popularity. This works well on both Weibo and Wechat. Eg. 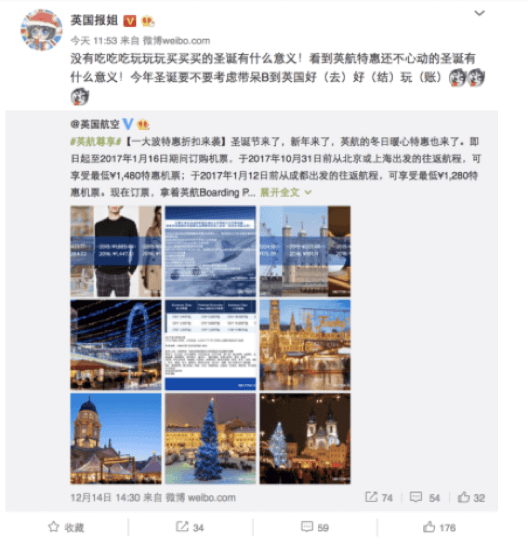 British airlines paid Weibo KOL 英国报姐(UK Times), who share everything interesting about the UK to post their own content. Usually the KOL will adjust and style the content in a way that makes it unique and more receptive. 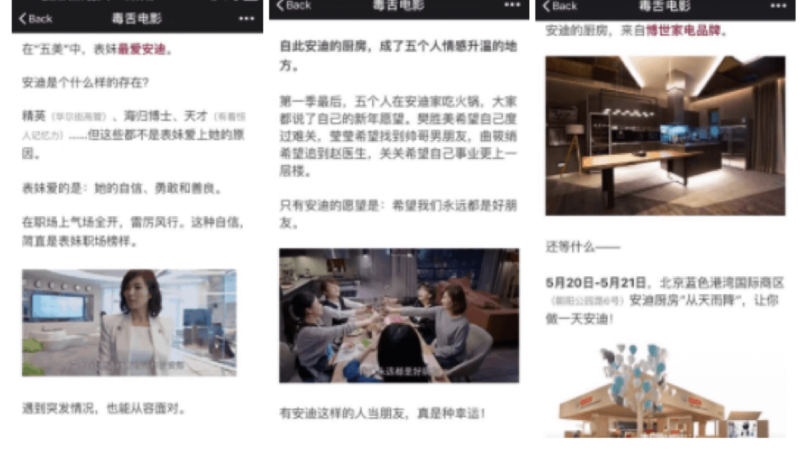 Advertorials are one of the most common ways to promote with KOLs on WeChat. KOLs write articles in their own style about the product. Since the articles are original created by the KOL, it feels less like an advertisement and readers are less likely to unsubscribe or click away. Eg. 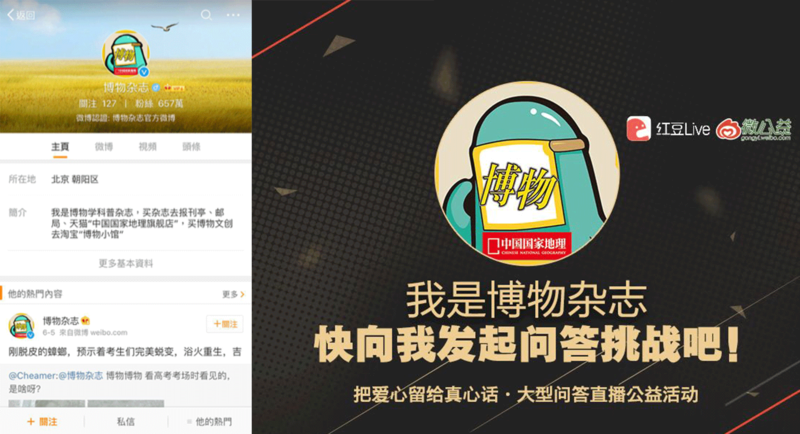 BSH Home Appliances partnered with WeChat KOL 毒舌电影(dsmovie) to promote their products and campaign. In the advertorial, Dmovie first analysed Ode to Joy (a TV series sponsored by BSH Home Appliances) and its character, then it started to critique the kitchen of the protagonist and informed readers BSH’s products. The article was read more than 100K times. 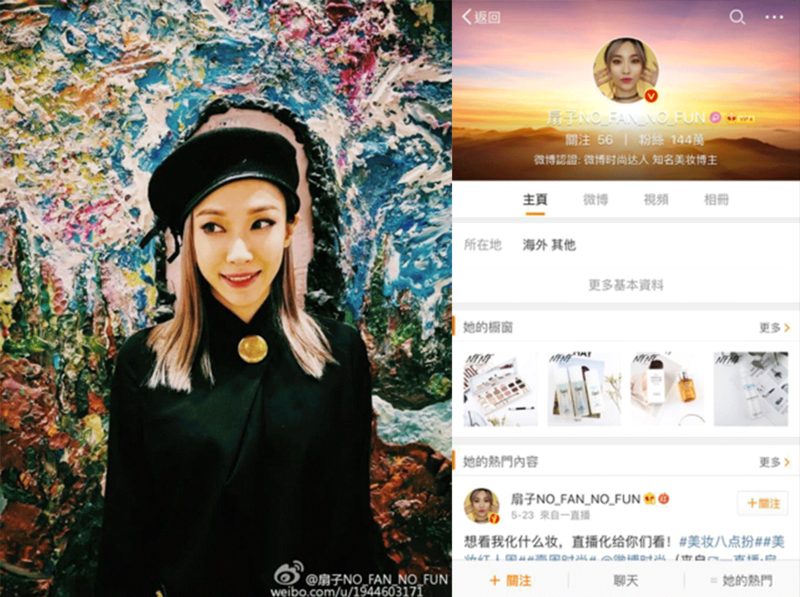 Another example is Rebecca Li, a fashion blogger who has 4.5 million fans on her Wechat account, the wonderland of Rebecca Li. 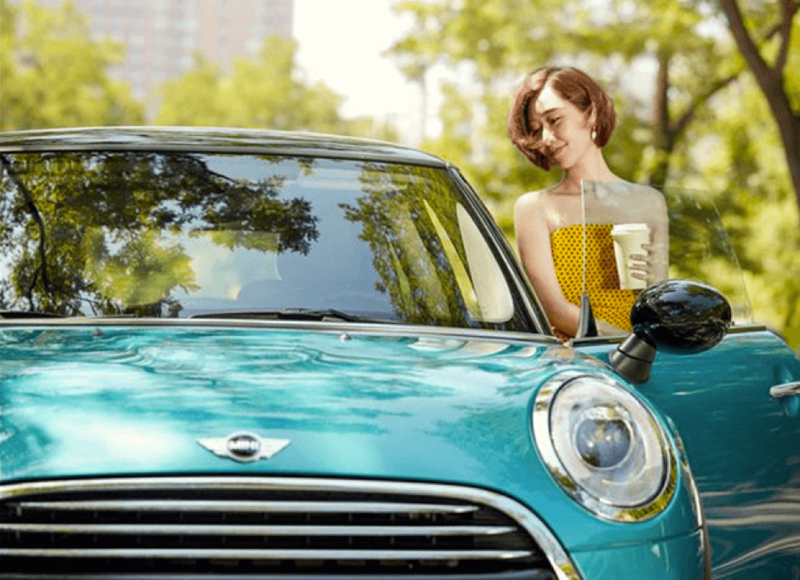 She just helped BMW to sale 100 limited edition of MINI YOURS in 4 minutes. All 100 sales were paid in 50 minutes. The power of fashion blogger and KOLs is remarkable. At first, Rebecca was not that confident in driving sales for high-end luxury cars. She has word-of-mouth in recommending fashion brands such as handbags and clothes, but not cars. However, the result was astonishing. Product reviews are powerful for KOL marketing as it could increase credibility to your brand, making your products more convincing and persuasive. In China, KOLs expect compensation if you want to receive high and positive quality feedback from them. Live product trials streaming is also becoming popular to attract customers. Eg. 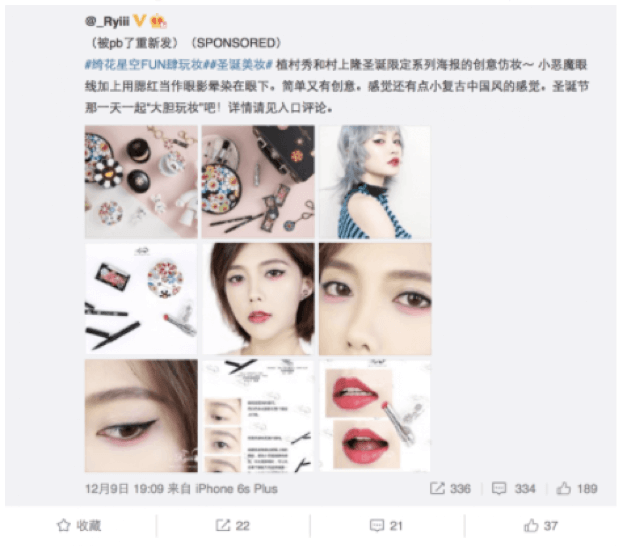 Ryiii, a famous beauty blogger on Weibo, shared a detailed make up tutorial featuring Shu Uemura products. It is crucial to identify a good KOL in order to achieve your business strategy objectives. A good KOL should be a good mixture of both relevance and popularity. Without the former, it’s meaningless for any exposure. But without the later, there won’t be enough exposure to speak of. Most importantly, especially in the Chinese market, is to be careful of fake or exaggerated KOL statistics. In this fast-changing world, everyone could become a KOL by buying followers and fans. A KOL with 4million followers is worthless if they have no interactions or engagements. Therefore, we should pay attention to the number of likes, retweets and comments and see if they are fudged or not.